The Spring 2008 Cover, "About Money." 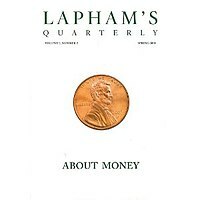 Lapham's Quarterly is a literary magazine established in 2007 by former Harper's Magazine editor Lewis H. Lapham. Each issue examines a theme using primary source material from history. The inaugural issue "States of War" contained dozens of essays, speeches, and excerpts from historical authors ranging from Thucydides, William Shakespeare, and Sun Tzu to Mark Twain, among others. Recent issue themes included "Foreigners", "Time", and "Youth". Each issue includes an introductory essay by Lapham, readings from historical contributors, and essays by contemporary writers and historians. Lapham left Harper's in 2006 to found Lapham's Quarterly, saying he had been thinking about the idea since 1998. "I had put together a collection of texts on the end of the world for the History Book Club. They wanted something at the turn of the millennium and I developed this idea by looking at the way the end of the world has ended [or been envisioned to end] many, many times and how predictions of doom have been spread across time. Whether you're talking about the Book of Revelation or tenth-century sects. So I had this wonderful collection of texts and I thought what a great idea. Also it was fun." Lapham's Quarterly is published by the American Agora Foundation, a not-for-profit foundation dedicated to fostering interest in history. The offices are located in New York City. As of 2014, the magazine had a staff of 17 and a circulation of 40,000. Since 2010 the magazine has produced a podcast featuring interviews and discussion related to topics from recent issues. ^ a b c d e Ron Rosenbaum (November 2012). "Lewis Lapham's Antidote to the Age of BuzzFeed". Smithsonian. Retrieved October 29, 2012. ^ "Lapham's Quarterly: The Podcast". iTunes. Retrieved 1 April 2013. Arango, Tim (Nov 30, 2009), "Present-Day Soapbox for Voices of the Past", The New York Times . Irvy, Sara (Dec 31, 2007), "In His Own Magazine, an Editor Puts Himself Into an Elite Group", The New York Times . "F. Scott Fitzgerald, It Seems, Never Met Lewis Lapham", by Gary Shapiro, New York Sun, February 23, 2007. "Lapham's Quarterly: Cutting-Edge Journalism From The Distant Past", Tony Hendra, Huffington Post, Dec 3, 2007. "My Library: Lewis Lapham", a look inside the journal’s operations. This page was last edited on 5 July 2018, at 20:35 (UTC).